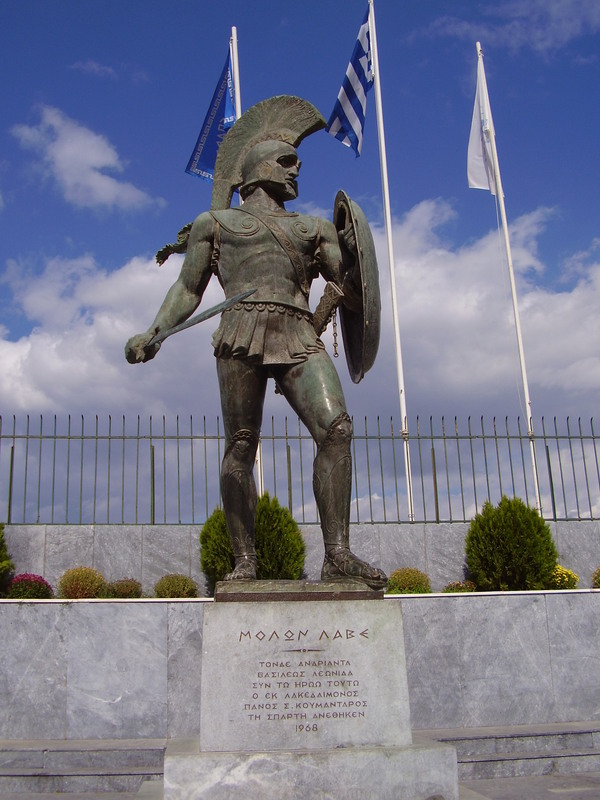 A modern memorial for king Leonidas in Sparta, inscribed with “molon labe.” Photo by author. It is not uncommon to see the Ancient Greek phrase “molon labe” emblazoned on shirts, posters, and placards in today’s North America. Meaning roughly “come and get them,” the phrase was a Spartan king’s response to the Persians’ request for the Greeks to lay down their arms at Thermopylae in 480 BCE. Now the phrase is used, unsurprisingly, by those arguing for expanded access to firearms, but also by those trumpeting a hardy, self-reliant lifestyle more generally. The ancient Spartans have an enduring allure today. Where the more famous Athenians are held up as an example of democracy, free expression, and cultural sophistication, the Spartans provide a model of republican restraint, of discipline and moderation, and of simple and noble courage. Yet, just as the Athenian legacy is tarnished by slavery, misogyny, and imperialism, the ideal image of Sparta whitewashes the sobering fact that the Spartans’ entire way of life was only possible because of the ruthless stealing of lands and the brutal and ongoing suppression of those lands’ native inhabitants. The not-guilty verdict for white farmer Gerald Stanley in his trial for the killing of Colten Boushie, a young Cree man, in Battleford, Saskatchewan, makes me wonder whether this Spartan tradition is still alive and well in Canada. What made the Spartans able to resist the Persians so stoutly, and with such rhetorical panache, was their constant training for war. Unlike the citizens of other Greek states, who were farmers most of the time, the Spartans were professional warriors, among the deadliest in the ancient world. The Spartans could spend so much time on sharpening their skills and hardening their bodies because others worked the land and did the menial jobs that society needs done in order to function. These non-military tasks fell to the Helots, a people dispossessed of everything and forced to live wretched lives as Sparta’s public slaves. The Spartans, though never more than a few thousand in number, had plenty of land to work in southern Greece. They came to possess this territory in a series of wars fought in the mists of the past, before any contemporary was writing history. Starting from their home territory of Laconia, the Spartans expanded west into the much larger plains of neighboring Messenia. The natives of Messenia, the Helots, not only lost ownership of their lands: they were made to work these same lands for their new Spartan masters. To keep the Helots in line, the Spartans ritually terrorized them, with beatings, killings, and public humiliation. So brutally effective were these methods that the Spartans maintained control of Messenia for centuries, despite the fact that Messenia and Laconia are separated by one of Greece’s most formidable mountain ranges – a barrier that should have prevented conquest in an era before modern communication and transportation. The Spartans also employed less overtly violent methods to keep the Helots in their place, and to remind young Spartans just how inferior the Helots were to full-blooded citizens. As an object lesson for youth, the Spartans routinely paraded drunk Helots in public, showing the evils of intoxication while reaffirming the rightness of the social status quo – good Spartans don’t get drunk like the Helots do. In Canada, the myth of the “drunken Indian” is a persistent one, and a “drunk list” targeting Indigenous persons was egregiously codified into the policy of the Liquor Control Board of Ontario for decades. The colonialist legacy of Canada, that settler Canadians enjoy their lands and privileges and profit largely to the continued detriment of Indigenous peoples, just like the Spartans did, could not be better summed up than by the Father of Confederation himself. As John A. Macdonald wrote to the Commissioner of Indian Affairs in 1885, in the context of the execution of Louis Riel (who was convicted by an all-white, Anglophone jury), and the mass execution of several Cree men, “The executions of the Indians ought to convince the Red Man that the White Man governs.” This strikes me as Canada’s krypteia. At the very least, it serves a similar social purpose. The similarities to Sparta don’t end there. As Robert Jago so powerfully expressed in Media Indigena on the day after the Stanley trial ended, the verdict itself and the behavior of the jury after the verdict was read (they all ran out of the courtroom, escorted by Mounties) demonstrate that Colten Boushie was killed, and his killer was excused, because of fear. Apparently someone didn’t like what Jago wrote, since the Media Indigena website was hacked shortly after the piece was published, and remained down for several days. White people are afraid of Indigenous peoples, which only exacerbates oppression and violence. For all their macho bluster and skill at arms, the Spartans were cripplingly afraid of the Helots, too. The Spartans had the best army in Greece, but were infamously loath to use it outside of their home territory because they feared a Helot revolt. The Helots therefore both made the Spartan army possible and, by their very existence as cruelly oppressed people, ensured that the army was always trained on them. The white settlers of Canada demonstrated through the Gerald Stanley trial that though they benefit immeasurably from the theft of Indigenous lands, they still live in fear of Indigenous peoples, especially young men that have the temerity to venture onto settler “property.” Ancient Sparta and modern Canada are stuck in the same perverse Catch-22. Despite films like 300, we need to stop glamorizing the Spartans and instead face up to what they really were: violent colonialists dependent on forced labour to support the military and political system that inspired the Romans, Jean Jacques Rousseau, the Framers of the US Constitution, and “freedom-lovers” the world over. Canada too needs to fess up to its colonial past and present. Settler Canadians (like me) especially need to ask ourselves why we are still afraid, why Colten Boushie was killed, and why his killer was found, by an apparently all-white jury, not guilty. As long as the Spartans and spirit behind their krypteia live in Canada, there cannot be justice, for Colten or any of us. Thanks for this. A great piece!